In addition to the services we provide, we believe it is important to share current, relevant information on the financial services industry and regional topics of interest with our clients. 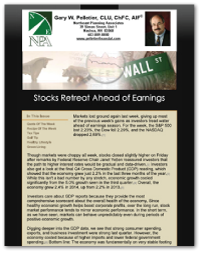 Our digital newsletter includes marketing information and data, financial headlines, and lifestyle tips. We email this out approximately once per week or in response to critical current events. Click the image below to review an example. 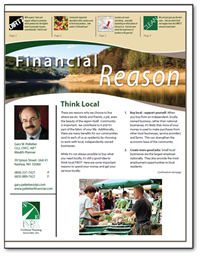 More regionally focused, our traditional newsletter is paper-based and mailed quarterly. It features family planning tips and information, interesting facts, and lifestyle articles. Click the image below to review an example.